Surprises en route but not in the contests that decided which players would meet in the final of the Women’s Singles event at the Seamaster 2018 ITTF World Tour Platinum Kaisa China Open in Shenzhen. On the evening of Saturday 2nd June, status prevailed as the host nation’s Ding Ning followed by colleague Wang Manyu reserved their places in the title deciding contest. Ding Ning, the no.9 seed ended the progress of brave Japanese qualifier, Saki Shibata, in four straight games (11-2, 11-7, 11-9, 11-6), before Wang Manyu, the no.4 seed, also caused the Land of the Rising Sun pain. She overcame Mima Ito, the no.6 seed, in a contest that was arguably closer than the four-one victory margin may suggest; two of the four games were decided by the minimal two point margin, one to each player (11-8, 12-10, 11-5, 10-12, 11-8). Simply as we have seen many times before when it came to exchanges in rallies then Ding Ning and Wang Manyu could keep the ball on the table one hit longer than their opponents. The short efficient strokes and moreover the exquisite balance have brought Chinese female players success time and again. Winner of every major title the sport has to offer, Ding Ning was a step ahead of Saki Shibata who has to be admired for her honest endeavours. However, as in years gone by when players tried to penetrate the backhand blocking skills of Zhang Yining and Li Xiaoxia, they were met with a brick wall. It is increasingly the situation with regards to Ding Ning; thou shalt not pass. Meanwhile, one wondered if Mima Ito, in a rich vein of form could turn the tables on Wang Manyu, having come so close in the same round the previous week in Hong Kong. 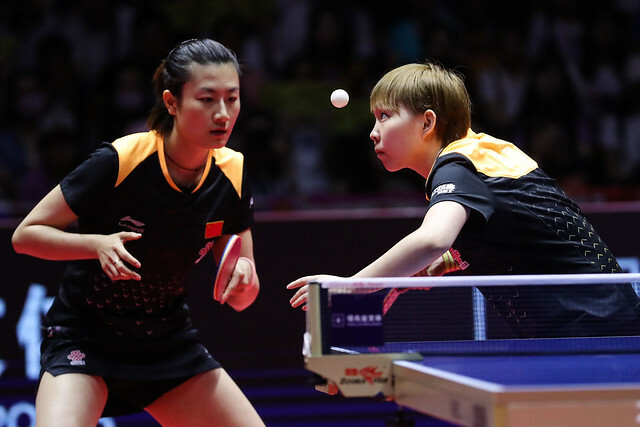 Videos had been studied, the homework had been completed and Wang Manyu maintained her ascendancy; starting with the 2014 ITTF World Tour Korea Open, Wang Manyu has now won all six meetings on the international stage. The final will be held on the evening of Sunday 3rd June.